The Historic Centre of Santa Cruz de Mompox has preserved its Spanish colonial character well. The city was founded on May 3, 1537 by Don Alonso de Heredia as a safe port on the Magdalena. Santa Cruz de Mompox became quite prosperous as a port for the transportation of goods upriver into the interior. A royal mint was established here and the town was famous for its goldsmiths. This prosperity had begun to wane in the Nineteenth Century, but continued until early in the Twentieth Century when the river shifted and sediment accumulated on this arm of the river. Cartagena, the masterpiece of the empire. At the same time, surraunded for pirates from England, and Holand. If you are a wealty, and aristocratic spaniard, living in Cartagena during the XVII-XVIII centuries, the smarter way to live in the area was moving to Mompox. An island in midle of the Magic Magdalena river, in midle of the rute to Honda-Bogota, and a shelter far away from Spain. Just the idea of Spain. Perhaps Seville was the model to build Mompox. One of the most magical Unesco Sites. Seven churches. San Francisco church just an idea of baroche. Breakfast at the marketplace. Arepa de huevo with an fresh orange juice in front of the river. You will love it. The marketplace from the river...just divine. 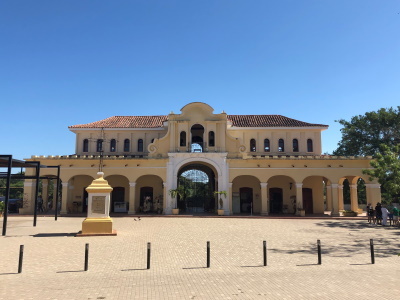 Hospitals: San Juan de Dios Hospital was founded in 1550, and is considered to be oldest hospital in America still functioning in its original building. Declarations of Independence: City Hall: it was here that on August 6, 1810 the Act of Independence from Spain was signed, and the cry "Ser Libres o Morir" ("Freedom or Death") was first heard. Fortified religious buildings: "The churches also served as forts in the earlier years of the city." Built in the 17th century: Chosen because of its Qualities "The urban landscape and architectural components of santa cruz de Mompox achieved a high level of unity and harmony during the 17th-19th centuries," and "The "house-store" buildings which began to appear in the 17th century" (AB ev). The town was founded in 1540.